Q. 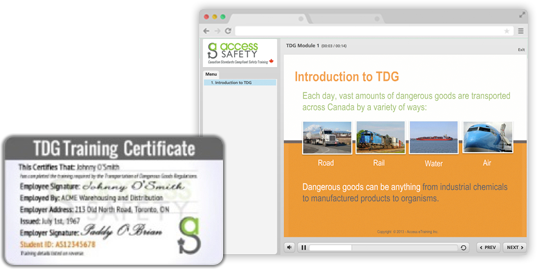 Are your safety courses recognized across Canada, or are they province specific? A: Yes, our courses are recognized across Canada. They have been developed by our staff of trained professionals to provide you with all the knowledge necessary to work in a safe environment. Q. Are all courses done online? A: Yes, all courses are taken online and are available 24/7. All that is needed is an internet connection. Q. When I try to do training on my account it gives me a message saying I can’t enroll myself. I have purchased course in the past and completed the training, why won’t it allow me to do the new training? A: It won’t allow you to enroll because you need to purchase the training first. Please visit remotesitesafety.ca to purchase the new training course, fill in your information and ensure you are using the SAME email from your account when purchasing. The system will recognize your email and soon after purchasing you will have the new training course available to you on your account. Q. Are the Remote Site Safety courses recognized in the industry? A: Absolutely – our courses have been used to train individuals and whole groups of staff all across Canada. Whether you need WHMIS for your retail job, or H2S to start your labour job in Oil & Gas – our training is written by experienced professionals who equip you with all the knowledge necessary to get to work and be safe. Q. I have to train more than one person do you offer discounts? A: We certainly do, and the discount information is available on each of our course pages. If you have more questions, please call us! Our toll free number is 1-877-348-8505. Q. I need to start work tomorrow! When will I get my certification card? A: For each and every one of our courses, as soon as you finish your course, you can print off your certificate right from your computer. You can also use any other computer connected to the internet to print it as well – whether at the library or in the HR office. Q. Do I need any books or CD’s to complete the course? A: No – All the training material can be found online, including student notes, module presentations and exams. Q. How much does it cost to register for an account? A: It’s Free! All of our accounts are free to register – you just need to purchase the courses and services you want. A: Courses can take anywhere from 45 minutes to 2 hours to complete. Q. When do your certificates expire after I have completed your training? A: TDG has a recommended renewal of 3 years and all other courses have a recommended renewal of 2 years. However, if you work for a new employer after completing your training, you will need to take the training again for your new employer. Q. If I purchase training from you, how long will it take for me to get the certification? A: After you have purchased your training, shortly after you will receive a confirmation email from support@remotesitesafety.ca with your login username and temporary password. Each course can generally take 45 minutes up to 2 hours, but it really depends on how fast you are. After successfully completing each exam from a course, you are able to print your certificate right away. Q. On the right side of my TDG certificate under “Training Details”, how come some boxes don’t have “X”s in them? A: There are boxes intentionally not marked on the certificate because they are for onsite site specific training for when the employer arrives at their worksite. It would be up to the employer to provide the onsite/hands on training and fill in the “X”s for the remaining blank boxes and sign the certificate. A: You certificate is available through the bottom link on your course details page. You must make sure you have successfully passed (80% or higher) all the module exams in order for the certificate to be issued. A: From your account, click on the course that you need your certificate. Within that course you will see a list showing you your Modules and Exams, at the very bottom you will see your “Certificate of Completion – Wallet”, and then click on it to open/save/print as a PDF. If you do not see the “Certificate of Completion – Wallet”, there is at least 1 Exam that still needs to be completed passing with 80% or higher. Q. I have finished all my exams but the certificate doesn’t appear for download, what do I do? A: Make sure you “Submit” all questions to be marked after answering them. You will also need to achieve 80% or higher on all module exams before the certificate becomes active for download. Q. Do you send/mail out certificates in the mail? A: Unfortunately no. Our system allows you to download the certificate as many times as you want in a PDF secure format. You can then email this to your employer/prospective employer and you can print the certificate yourself. We recommend you take the certificate to a local stationary shop to get it laminated to protect the certificate. Q. How much does it cost to register an account? A: Registering an account is absolutely free. The only cost is for the price of the course itself. Q. How do I pay for the courses? A: You can pay online using Visa, MasterCard, or PayPal. Q. When I’m trying to purchase the course it mentions “Ship to”, what does that mean? A: Customer can ignore this field as all courses are conducted online. We do not ship out any learning materials. Q. Can I purchase with a VISA or Mastercard Gift Card? A: You can as long as you have called the credit card company and have a physical address attached to the card. For payments to successfully go through our system you must have a 3 digit CVV number which will be on the back of your credit card and an address that is associated with your gift credit card. In most cases you can contact Visa or Mastercard and they will do that for you. Q. Can I purchase your training if I use someone else’ credit card? A: Yes you can. However, the system will recognize the name holder on the credit card and create an account with that name, so any certificates completed will have the name from the credit card. After you have purchased your training and have received an email from Remote Site Safety with your account information, we can go into your account and change the name. Q. How long does it take to complete your training courses? A: It can vary from 45 minutes up to 2 hours, but it really depends on how fast you may be. Q. What % do I need to pass an exam? A: You will need 80% or higher to pass the exam and you’re allowed as many attempts as you need to pass the exam. Q. How many attempts do I have for each of the exams? A: You are allowed as many attempts as you need to pass an exam. Q. What is the difference between online H2S Awareness and in class H2S Alive? A: The difference between our H2S Awareness course and the H2S Alive course is as follows: Our H2S Awareness course is all completed online and is completely theory-based that gives you a lot of knowledge and information on H2S in the workplace. This is why our course is generally a lot cheaper than the H2S Alive course. The H2S Alive course is usually a full one day 8 hour course that you must go to a site or classroom for. They have more of a practical based program that gives you a more hands on learning experience. Many workplaces offer their own practical training, in which case our awareness course would be a perfect combination, if you are getting the hands on from your employer. If they do not offer this, you will need to check with your employer to see if they would prefer that you take the more expensive one day course or our online course. Q. My certificate won’t display name and tracking number. A: You will need to install/update the latest version of Adobe Reader, then restart their computer, and lastly save certificate file to desktop. Q. How do I change my name on my certificate(s)? A: You will need to contact Remote Site Safety directly to change any information on your certificate. Q. What’s my login username and password? A: After purchasing your training course(s), you will be emailed your login username and password to the email account that you entered when purchasing. If you can’t find the email contact us. Q. Why can’t I view the course presentation? A: Make sure you have allowed “Pop-ups”, as the presentation loads in a separate window. Also make sure that you have up-to-date versions of Java and Adobe Flash Player on your computer. If you need to install them please make sure that you restart your computer after install so the computer can update the software successfully. Q. How do I access my training on my iPad/iPhone/etc.? A: Unfortunately all of the courses we offer require Adobe Flash software. This software is not present on iPads or other Apple handheld devices. We recommend logging in and continuing your training from a desktop computer, or a device which supports Adobe Flash applications.